Board a comfy, customized catamaran on route to some delicious burger-making and prime dolphin-watching! 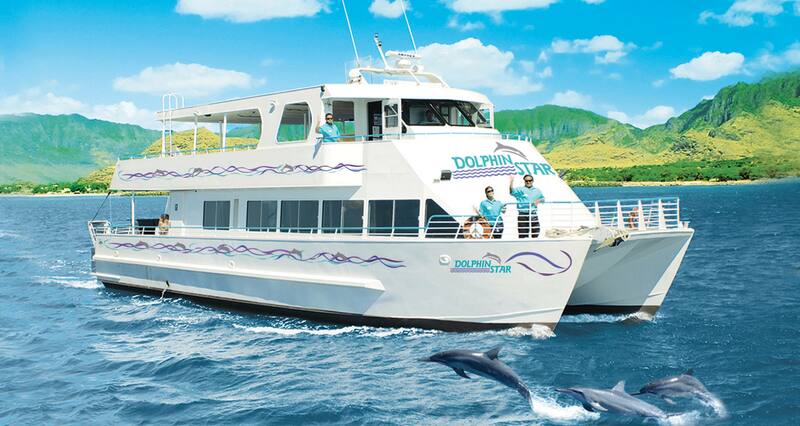 The Dolphin Star sports 2 decks, carries up to 149 passengers, and even has room for you to barbecue a gourmet burger. Ride a comfortable motorcoach to Wai‘anae Boat Harbor. * Enjoy a short video presentation while riding to the pier. Board the Dolphin Star, a catamaran that is customized for watching dolphins. Its 2 panoramic decks are ideal for scanning the waters for a variety of wild dolphins and other marine life. Depart from Wai'anae Boat Harbor. Cruise the clear, calm waters on the lookout for playful spinner, bottlenose and spotted dolphins against the stunning backdrop of the Wai'anae Mountain Range. A crew of certified naturalists will be available to guide your viewing. Satisfy your hunger with a gourmet burger lunch designed by you! You will be provided with freshly grilled premium hamburgers, a selection of buns-freshly baked taro or Kaiser, and a variety of gourmet fixings-including grilled pineapple, avocado, Kamuela vine-ripened tomato, purple onion and Kula lettuce. You will also get your pick of various cheeses and a selection of sauces-teriyaki, spicy barbecue or tomato. A vegan garden burger is available with 24 hours' notice. All-you-can-drink fruit punch is included as a beverage, with additional drink choices available for purchase. *Please Note: Motorcoach transportation from Aulani Resort is not included, but is available at an additional charge. Excursion operators are independent contractors that are not agents of—nor supervised or controlled by—Disney. Motorcoach transportation from Aulani Resort is not included, but is available at an additional cost. We encourage Guests to dress in casual attire. Bring sunscreen and a camera.